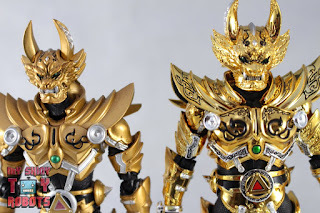 The 2014 Tamashii Nations Event was notable for announcing the long-awaited return of GARO to the S.H. Figuarts line, but while the releases of both the Ryuga and Leon figures followed fairly swiftly there was one key figure that took much longer to show up again. However after nearly four years of waiting S.H. Figuarts Shinkocchou Seihou Garo (Saejima Kouga) has finally arrived - the first figure in the S.H. Figuarts Shinkocchou Seihou line that doesn't hail from the Kamen Rider franchise. 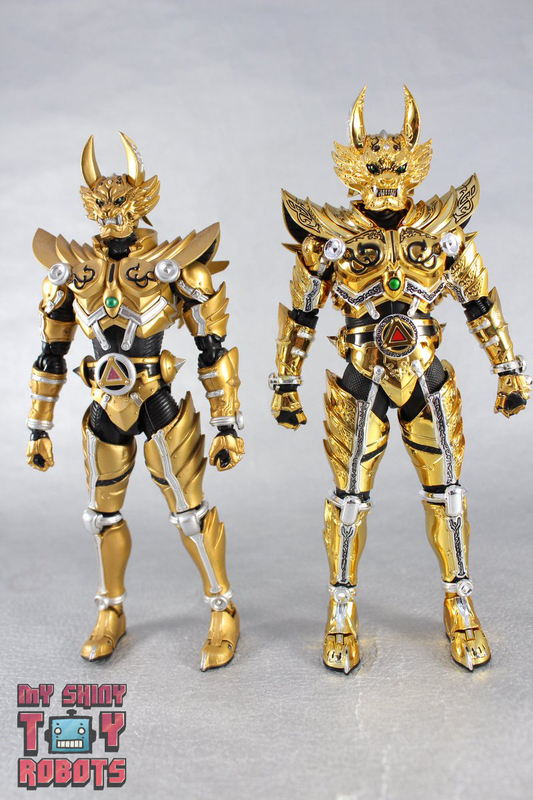 As the name suggests this is the armour worn by Kouga Saejima, the first Golden Knight from the franchise and lead character of both the original series and Makai Senki. S.H. Figuarts Shinkocchou Seihou Garo (Saejima Kouga) was released as a Tamashii web exclusive, and at 9990 yen is certainly one of the most expensive standard sized Figuarts released thus far. "This model is designed on the concept of "realism". A reproduction of a heroic figure with a skeleton core made by Shinkocchou Seihou." Where do you even start when talking about the phenomenal sculpting work that went into this figure? Probably with the fact that it's just so damn shiny! 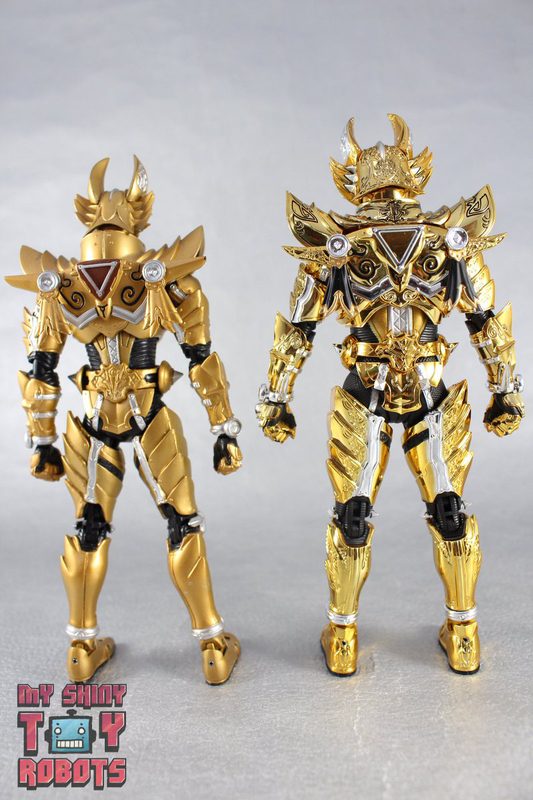 Every single bit of gold and silver on Shinkocchou Seihou Garo is metallic chrome, giving it that same overwhelming sheen the armour has on the show itself. From a distance it looks flawlessly applied and for the most part the same can be said up close as well, but it would definitely be worth inspecting the figure for any possible QC errors when you have it in hand. Unfortunately mine has a fairly sizeable speck completely missing from the right silver cuff, which isn't too noticeable for the most part but shouldn't really be justifiable on a 9990 yen figure. The heavy use of chrome also makes the figure feel incredibly light - far moreso than your average Figuarts release. But despite it doesn't feel especially fragile at all, and though no-one can be sure how well the chrome will stand the test of time yet I don't feel like I'm going to break the figure just from picking it up and reposing it. Contrary to what you might think the chrome doesn't seem to be the fingerprints magnet you'd assume it to be, at least not to the extent other chrome Figuarts like the Space Sheriff releases are anyway. I initially planned to shoot the gallery while wearing gloves to handle the figure, but managed perfectly okay without them in the end. But it isn't just the chrome that makes this figure so damn impressive, it's also the sheer level of detailing the sculpt has. Pretty much every piece of the armour has ornate detailing etched into, most of which isn't even filled in with colour so can only be truly appreciated when looking at the figure up close. But then on top of all that you have the other usual Figuarts pleasures - a matte black undersuit, sharp paint apps that manage to stand out on an already ridiculously eye-catching figure, and so much more. The S.H. Figuarts Shinkocchou Seihou line has put out amazing figure after amazing figure, but this raises the bar exponentially even for them. On a visual level, this thing feels like a work of art. 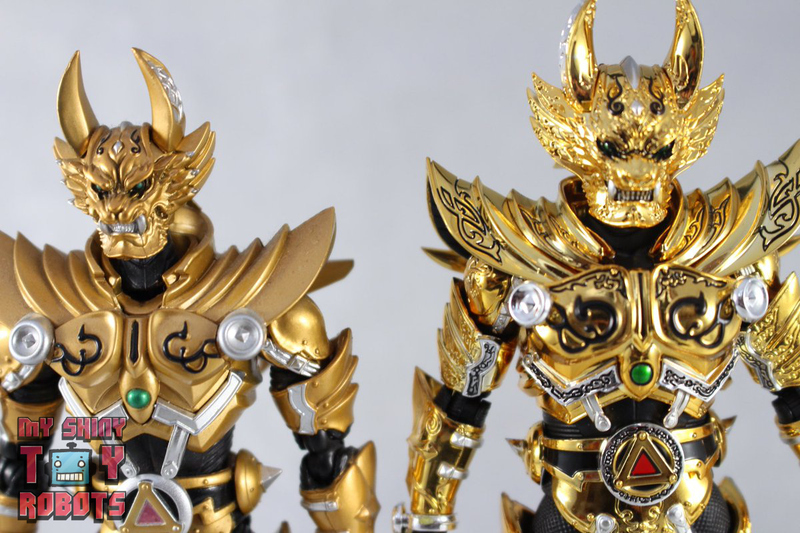 A quick comparison with the original Kouga Garo release from 2011 illustrates just how much Tamashii Nations have excelled on this figure. Having the two side by side really highlights just how much was detail was missing from the original release - not just the markings on the armour itself, but also more explicit details like the blades on the wrist cuffs. The proportions are also considerably better on the Shinkocchou Seihou figure, which should really come as a surprise since things have come a long way in seven years. There are undoubtedly going to be people who prefer the finish on the original to the admittedly gaudy chrome look, but in terms of accuracy and quality there is absolutely no comparison between the two. After so much to talk about when it comes to the sculpt the articulation seems a lot more straightforward by comparison, but even that has a few little surprises in store. The base body features all the standard joints and articulation for a Shinkocchou Seihou figure, so the usual array of balljoints in the head, neck, shoulders, waist, torso, wrists and hips as well as double hinged elbows and knees, some surprisingly manoeuvrable ankle tilts and then of course the hinged toe piece to cap it all off. Now you only have to take one look at the figure to immediately know that those shoulder pads are going to restrict the arms somewhat, and while that is true they do some upwards motion to help alleviate it a little. The collar piece is free-floating so is able to move along with them accordingly, and the same can be said for the belt section and waist joint. A more interesting bit of articulation however are the upper arm sections, which can be rotated just below the elbow as well as just above the bicep. This means that that whole piece of the arm can be freely rotated, and while doing this extensively can make the arm pattern not match up it does add a fair bit of extra movement to the arms. Let's be honest - this was never going to be the most articulated figure ever because it's a literal suit of armour and any real agility in the series is done through CGI trickery. But with that in mind Shinkocchou Seihou Garo can everything that it should be able to do, and it does so without any fear or breakage or spoiling the chrome. Even changing the hands is a surprisingly stress-free process, and here there are thin wrist blades to worry about on top of the usual wrist joint worries. 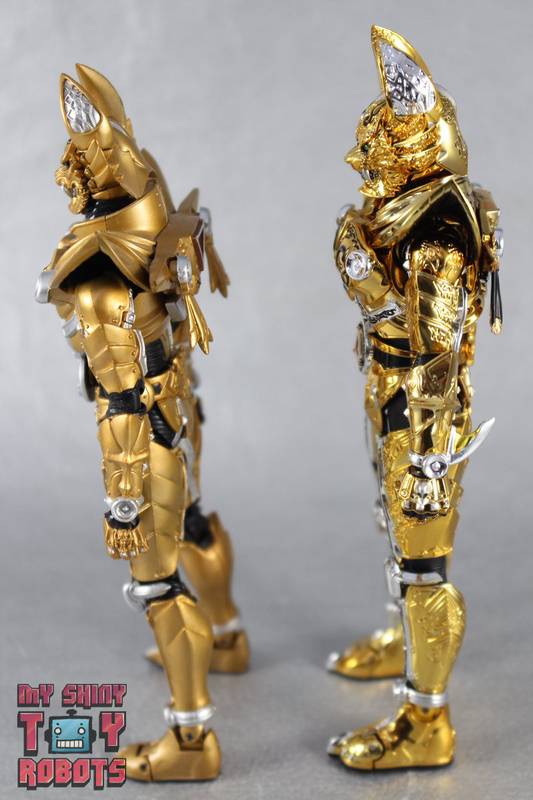 For accessories Garo includes the Garo Ken sword, an alternate sheathed version with removable hand and three alternate pairs of hands (one open pair, one for holding the sword and another for holding the scabbard). Unlike the original release this Garo Ken is properly detailed with all the silver markings across the blade itself, which should to be expected given that this is the Shinkocchou Seihou line but was also present on the other three Garo armours released anyway. The scabbard is a little more basic but still nicely detailed, and the small metal chain dangling from it is a great little bit of added accuracy. Not a bad selection of accessories by any means, but a little less than the original Kouga Garo figure which included five hands, the Garo Ken, a completely working scabbard AND a cape. The subsequent Taiga Garo release then added the much larger Garo Zanbaken sword on top of all that. While the omission of the Garo Zanbaken doesn't feel like a particularly great loss, it is a pity that the cape has been omitted when Shinkocchou Seihou figures have been fairly expansive with their accessories in the past. That said, there's no way the line would have settled for a basic plastic cape on a figure like this and it was already expensive enough because of the sculpting/chrome so that probably explains its absence. So all in all while this isn't the most expansive GARO accessory count out there, it does cover all the basics and that's the most important thing. What this figure does desperately need though, and this isn't really something that could have been included to proper effect, are green Tamashii flames. The small clip on ones that came with the Kamen Rider Amazons figures (though you wouldn't want to be clipping anything onto this figure) or simply a translucent sheath to put over the sword would have been nice, but what it really needs is the full package. Tamashii Nations themselves haven't put out an official set of green flames just yet, but there is a perfectly acceptable KO version that surely does the job wonderfully in their absence. Definitely something I'm planning to pick up at some point to go along with it. So is S.H. Figuarts Shinkocchou Seihou Garo (Saejima Kouga) the greatest Figuart ever produced? That's honestly going to depend on what you look for in a figure. As far as shininess goes it wins hands down, absolutely no contest there. In terms of detailing its definitely a real contender, as it manages to capture so many intricate details of the suit at such a small scale - and does it on chrome no less. Playability is the one area that's a little more up in the air, since a figure as intricate (and expensive) as this is always going to make you feel far more cautious and the jury is still out on just how well all that chrome is going to fare as time passes. The 9990 yen price tag is definitely a steep one, but for GARO fans there isn't any question as to whether this is going become the centrepiece in your collection or not. Shinkocchou Seihou Garo really is a new standard for the S.H. Figuarts line, and for the time being it's definitely something worthy of awe.